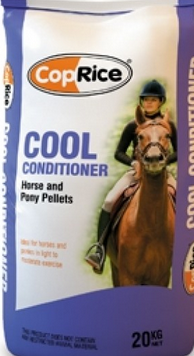 HYGAIN® ICE®is a high fibre, low starch, fortified pellet scientifically formulated to provide cool slow release energy for calm conditioning and healthy gut function. 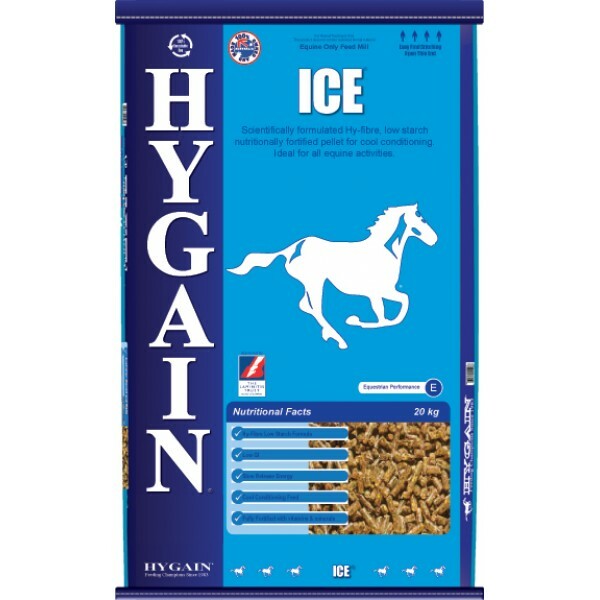 HYGAIN® ICE®is a blend of the following quality ingredients: Soya Bean hulls, Vegetable Protein Meals, Legumes, Legume hulls, Mill run, Lucerne Meal, HYGAIN® RBO® Equine Performance Oil® (Rice Bran Oil including Omega essential fatty acids and natural antioxidants), Calcium Carbonate, Di-Calcium Phosphate, Salt, Magnesium Oxide and Hygain Vitamin and Mineral Premix. Special ingredients Super Fibres – As the name suggests super fibre is a product that contains highly digestible fibre with very little non-digestible fibre. These highly digestible fibre sources provide horses with a calorie content similar to grain, however since they are fibre they are safer to feed and given that super fibres are digested in the hindgut(cecum and colon) they do not produce rapid changes in blood sugar (fizz) like grain. 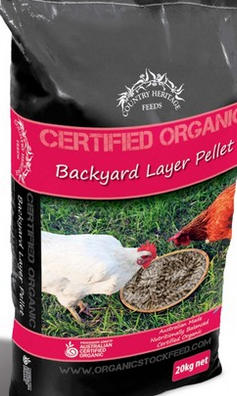 Super fibres are as safe to feed as chaff and even more digestible. Natural Vitamin E – This unique and highly stable form of Natural Vitamin E known as RRR-a-tocopherol is up to 5 times more bio available and potent than regular synthetic sources of Vitamin E. Research has shown that this form of Natural Vitamin E provides higher retention levels in plasma further aiding antioxidant, immune, cardiovascular, circulatory, neuromuscular and reproductive functions. HYGAIN® RBO® – RBO® Equine Performance Oil® is a blend of rice bran oil, omega 3, 6 & 9 essential fatty acids and natural anti-oxidants known to improve the health and structural integrity of cell membranes. RBO® oil plays an important role in maximising energy efficiency due to its energy dense nature and is digested efficiently in the small intestine reducing the ‘sugar high’ associated with high grain diets. RBO® promotes growth and development of the muscular system, top line and a healthy skin and coat. Biotin – Biotin, a water soluble vitamin is required by the enzymes responsible for protein synthesis and as a result is an essential vitamin for the healthy growth of hair and hooves. Research has shown that biotin improves skin and coat condition, increases hoof integrity and is widely recommended by farriers and veterinarians. Bio-Available Selenium – Selenium acts as an antioxidant to prevent fatty acid oxidation which can cause tissue damage. Research has shown that Sel-Plex®, an organic form of selenium, is more readily absorbed and retained than selenium in inorganic forms.